Explore Perth's surroundings by going to Fremantle (Fremantle Markets, Fremantle Prison, & more) and Caversham Wildlife Park (in Whiteman). Dedicate the 20th (Sat) to wine at some of the top wineries in the area. Pack the 24th (Wed) with family-friendly diversions at Adventure World Perth Australia. 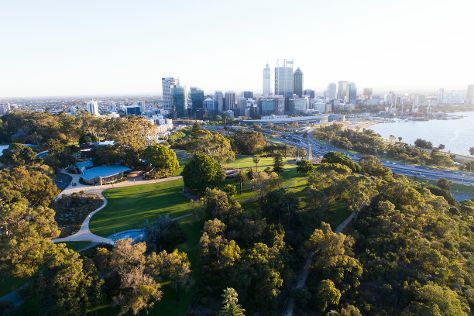 The adventure continues: take in nature's colorful creations at Kings Park & Botanic Garden, explore the world behind art at Art Gallery of Western Australia, learn about wildlife with up-close encounters at Perth Zoo, and go for a stroll along the water at Hillarys Boat Harbour. For where to stay, reviews, maps, and more tourist information, read our Perth travel itinerary planner . If you are flying in from Singapore, the closest major airport is Perth International Airport. In April, daily temperatures in Perth can reach 31°C, while at night they dip to 15°C. Finish your sightseeing early on the 25th (Thu) to allow enough time to travel back home.